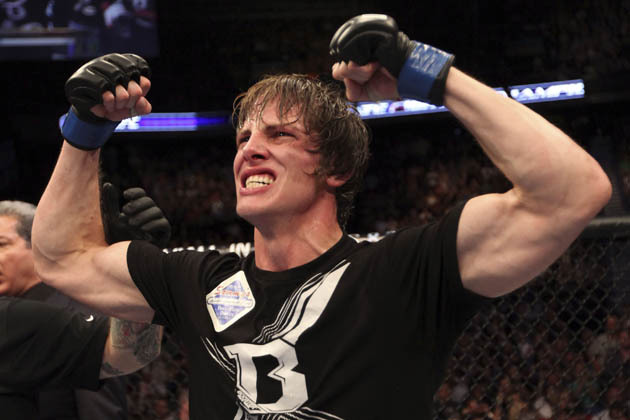 With family matters on his mind, Matthew Riddle earned a win at UFC 149 with an arm triangle choke of Chris Clements. After a bruising two and a half rounds, Clements tried a spinning back fist. Riddle grabbed Clements' arm, and maneuvered him into an arm triangle while the pair was still standing. They fell to the ground, but Riddle held on. Clements tapped at 2:02 in the third round, giving Riddle the win. After telling UFC commentator Joe Rogan he loved him, Riddle turned his focus to his wife and kids. "I wanna say I love my wife Lisa. We have a kid on the way, and we already have twins. I love you all," Riddle said after his win. Riddle's devotion went beyond mentioning his wife to the crowd in Calgary and the pay-per-view audience. Instead of flying from Texas to Calgary for the fights, Dave Farra reports Riddle drove 20 hours because he wanted her at the fights with him. Pregnant women are often advised not to fly during certain parts of their pregnancies, so he made the sacrifice so she could be there to support him. Riddle won a $65,000 Submission of the Night bonus, which should help with the baby on the way.